Calculate final temperature from heat transfer. So far we have discussed temperature change due to heat transfer. No temperature change occurs from heat transfer if ice melts and becomes liquid water (i.e., during a phase change). For example, consider water dripping from icicles melting on a roof warmed by the Sun. Conversely, water freezes in an ice tray cooled by lower-temperature surroundings. Energy is required to melt a solid because the cohesive bonds between the molecules in the solid must be broken apart such that, in the liquid, the molecules can move around at comparable kinetic energies; thus, there is no rise in temperature. Similarly, energy is needed to vaporize a liquid, because molecules in a liquid interact with each other via attractive forces. There is no temperature change until a phase change is complete. The temperature of a cup of soda initially at stays at until all the ice has melted. Conversely, energy is released during freezing and condensation, usually in the form of thermal energy. Work is done by cohesive forces when molecules are brought together. The corresponding energy must be given off (dissipated) to allow them to stay together Figure 2.
where the latent heat of fusion, and latent heat of vaporization, are material constants that are determined experimentally. See (Table 2). Figure 2. 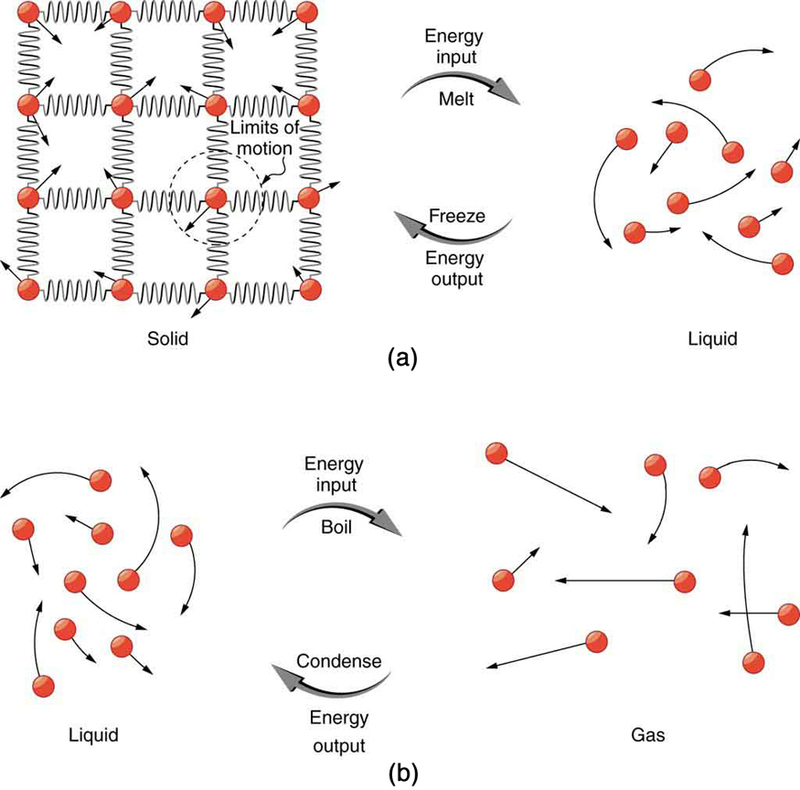 (a) Energy is required to partially overcome the attractive forces between molecules in a solid to form a liquid. That same energy must be removed for freezing to take place. (b) Molecules are separated by large distances when going from liquid to vapor, requiring significant energy to overcome molecular attraction. The same energy must be removed for condensation to take place. There is no temperature change until a phase change is complete. Latent heat is measured in units of J/kg. Both and depend on the substance, particularly on the strength of its molecular forces as noted earlier. and are collectively called latent heat coefficients. They are latent, or hidden, because in phase changes, energy enters or leaves a system without causing a temperature change in the system; so, in effect, the energy is hidden. Table 2 lists representative values of and together with melting and boiling points. The table shows that significant amounts of energy are involved in phase changes. Let us look, for example, at how much energy is needed to melt a kilogram of ice at to produce a kilogram of water at Using the equation for a change in temperature and the value for water from Table 2, we find that is the energy to melt a kilogram of ice. 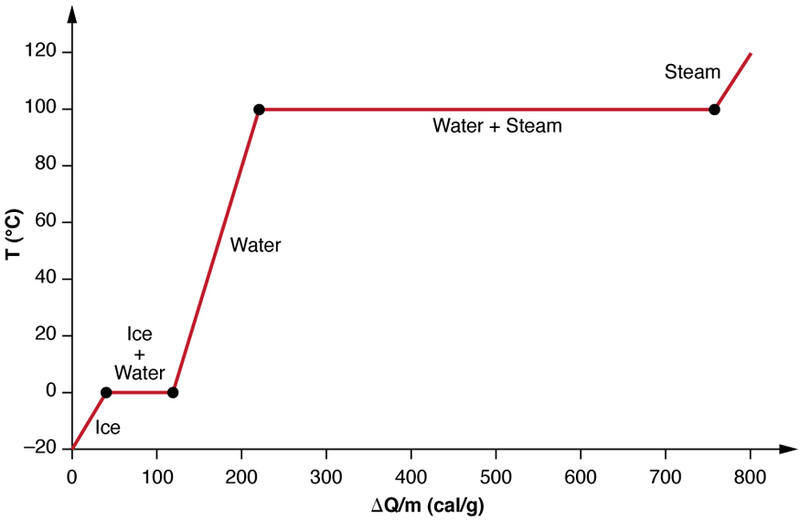 This is a lot of energy as it represents the same amount of energy needed to raise the temperature of 1 kg of liquid water from to Even more energy is required to vaporize water; it would take 2256 kJ to change 1 kg of liquid water at the normal boiling point ( at atmospheric pressure) to steam (water vapor). This example shows that the energy for a phase change is enormous compared to energy associated with temperature changes without a phase change. Phase changes can have a tremendous stabilizing effect even on temperatures that are not near the melting and boiling points, because evaporation and condensation (conversion of a gas into a liquid state) occur even at temperatures below the boiling point. Take, for example, the fact that air temperatures in humid climates rarely go above which is because most heat transfer goes into evaporating water into the air. Similarly, temperatures in humid weather rarely fall below the dew point because enormous heat is released when water vapor condenses. Figure 3. A graph of temperature versus energy added. The system is constructed so that no vapor evaporates while ice warms to become liquid water, and so that, when vaporization occurs, the vapor remains in of the system. The long stretches of constant temperature values at 0ºC and 100ºC reflect the large latent heat of melting and vaporization, respectively. Water can evaporate at temperatures below the boiling point. More energy is required than at the boiling point, because the kinetic energy of water molecules at temperatures below is less than that at hence less energy is available from random thermal motions. Take, for example, the fact that, at body temperature, perspiration from the skin requires a heat input of 2428 kJ/kg, which is about 10 percent higher than the latent heat of vaporization at This heat comes from the skin, and thus provides an effective cooling mechanism in hot weather. High humidity inhibits evaporation, so that body temperature might rise, leaving unevaporated sweat on your brow. Three ice cubes are used to chill a soda at with mass The ice is at and each ice cube has a mass of 6.0 g. Assume that the soda is kept in a foam container so that heat loss can be ignored. Assume the soda has the same heat capacity as water. Find the final temperature when all ice has melted. This example illustrates the enormous energies involved during a phase change. 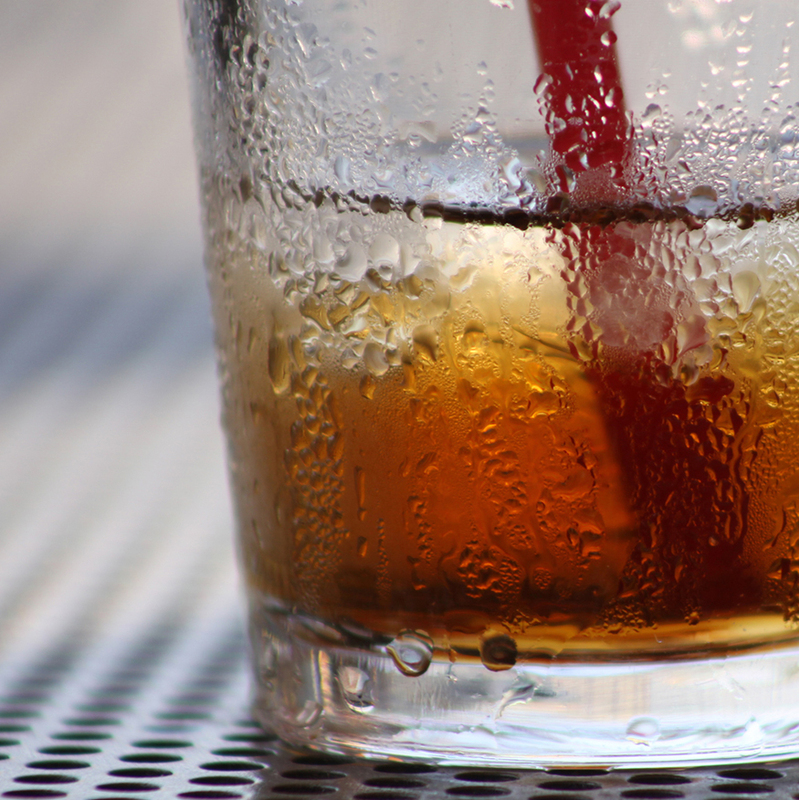 The mass of ice is about 7 percent the mass of water but leads to a noticeable change in the temperature of soda. Although we assumed that the ice was at the freezing temperature, this is incorrect: the typical temperature is However, this correction gives a final temperature that is essentially identical to the result we found. Can you explain why? Energy is also released when a liquid freezes. This phenomenon is used by fruit growers in Florida to protect oranges when the temperature is close to the freezing point Growers spray water on the plants in orchards so that the water freezes and heat is released to the growing oranges on the trees. This prevents the temperature inside the orange from dropping below freezing, which would damage the fruit. Sublimation is the transition from solid to vapor phase. You may have noticed that snow can disappear into thin air without a trace of liquid water, or the disappearance of ice cubes in a freezer. The reverse is also true: Frost can form on very cold windows without going through the liquid stage. A popular effect is the making of “smoke” from dry ice, which is solid carbon dioxide. Sublimation occurs because the equilibrium vapor pressure of solids is not zero. Certain air fresheners use the sublimation of a solid to inject a perfume into the room. Moth balls are a slightly toxic example of a phenol (an organic compound) that sublimates, while some solids, such as osmium tetroxide, are so toxic that they must be kept in sealed containers to prevent human exposure to their sublimation-produced vapors. All phase transitions involve heat. In the case of direct solid-vapor transitions, the energy required is given by the equation where is the heat of sublimation, which is the energy required to change 1.00 kg of a substance from the solid phase to the vapor phase. is analogous to and and its value depends on the substance. Sublimation requires energy input, so that dry ice is an effective coolant, whereas the reverse process (i.e., frosting) releases energy. The amount of energy required for sublimation is of the same order of magnitude as that for other phase transitions. The material presented in this section and the preceding section allows us to calculate any number of effects related to temperature and phase change. In each case, it is necessary to identify which temperature and phase changes are taking place and then to apply the appropriate equation. Keep in mind that heat transfer and work can cause both temperature and phase changes. Examine the situation to determine that there is a change in the temperature or phase. Is there heat transfer into or out of the system? When the presence or absence of a phase change is not obvious, you may wish to first solve the problem as if there were no phase changes, and examine the temperature change obtained. If it is sufficient to take you past a boiling or melting point, you should then go back and do the problem in steps—temperature change, phase change, subsequent temperature change, and so on. Identify and list all objects that change temperature and phase. Identify exactly what needs to be determined in the problem (identify the unknowns). A written list is useful. Make a list of what is given or what can be inferred from the problem as stated (identify the knowns). Solve the appropriate equation for the quantity to be determined (the unknown). If there is a temperature change, the transferred heat depends on the specific heat (see Chapter 14.2 Example 2) whereas, for a phase change, the transferred heat depends on the latent heat. See Table 2. Substitute the knowns along with their units into the appropriate equation and obtain numerical solutions complete with units. You will need to do this in steps if there is more than one stage to the process (such as a temperature change followed by a phase change). Check the answer to see if it is reasonable: Does it make sense? As an example, be certain that the temperature change does not also cause a phase change that you have not taken into account. 1: Why does snow remain on mountain slopes even when daytime temperatures are higher than the freezing temperature? Phase changes occur at fixed temperatures for a given substance at a given pressure, and these temperatures are called boiling and freezing (or melting) points. where is the latent heat coefficient. 1: Heat transfer can cause temperature and phase changes. What else can cause these changes? 2: How does the latent heat of fusion of water help slow the decrease of air temperatures, perhaps preventing temperatures from falling significantly below in the vicinity of large bodies of water? 3: What is the temperature of ice right after it is formed by freezing water? 4: If you place water in an insulated container, what will happen? 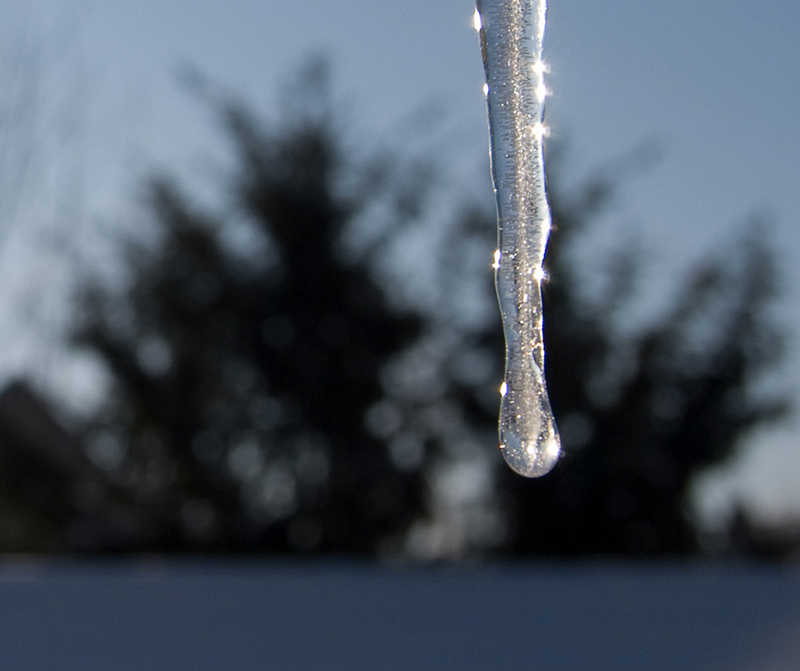 Will some ice melt, will more water freeze, or will neither take place? 5: What effect does condensation on a glass of ice water have on the rate at which the ice melts? Will the condensation speed up the melting process or slow it down? 6: In very humid climates where there are numerous bodies of water, such as in Florida, it is unusual for temperatures to rise above about In deserts, however, temperatures can rise far above this. Explain how the evaporation of water helps limit high temperatures in humid climates. 7: In winters, it is often warmer in San Francisco than in nearby Sacramento, 150 km inland. In summers, it is nearly always hotter in Sacramento. Explain how the bodies of water surrounding San Francisco moderate its extreme temperatures. 8: Putting a lid on a boiling pot greatly reduces the heat transfer necessary to keep it boiling. Explain why. 9: Freeze-dried foods have been dehydrated in a vacuum. During the process, the food freezes and must be heated to facilitate dehydration. Explain both how the vacuum speeds up dehydration and why the food freezes as a result. 10: When still air cools by radiating at night, it is unusual for temperatures to fall below the dew point. Explain why. 11: In a physics classroom demonstration, an instructor inflates a balloon by mouth and then cools it in liquid nitrogen. When cold, the shrunken balloon has a small amount of light blue liquid in it, as well as some snow-like crystals. As it warms up, the liquid boils, and part of the crystals sublimate, with some crystals lingering for awhile and then producing a liquid. Identify the blue liquid and the two solids in the cold balloon. Justify your identifications using data from Table 2. 1: How much heat transfer (in kilocalories) is required to thaw a 0.450-kg package of frozen vegetables originally at if their heat of fusion is the same as that of water? 2: A bag containing ice is much more effective in absorbing energy than one containing the same amount of water. How much heat transfer is required to first melt 0.800 kg of ice and then raise its temperature? Explain how your answer supports the contention that the ice is more effective. 4: The formation of condensation on a glass of ice water causes the ice to melt faster than it would otherwise. If 8.00 g of condensation forms on a glass containing both water and 200 g of ice, how many grams of the ice will melt as a result? Assume no other heat transfer occurs. 6: On a certain dry sunny day, a swimming pool’s temperature would rise by if not for evaporation. What fraction of the water must evaporate to carry away precisely enough energy to keep the temperature constant? 7: (a) How much heat transfer is necessary to raise the temperature of a 0.200-kg piece of ice from to including the energy needed for phase changes? (b) How much time is required for each stage, assuming a constant 20.0 kJ/s rate of heat transfer? (c) Make a graph of temperature versus time for this process. 8: In 1986, a gargantuan iceberg broke away from the Ross Ice Shelf in Antarctica. It was approximately a rectangle 160 km long, 40.0 km wide, and 250 m thick. (b) How much heat transfer (in joules) is needed to melt it? (c) How many years would it take sunlight alone to melt ice this thick, if the ice absorbs an average of 12.00 h per day? 10: (a) It is difficult to extinguish a fire on a crude oil tanker, because each liter of crude oil releases of energy when burned. To illustrate this difficulty, calculate the number of liters of water that must be expended to absorb the energy released by burning 1.00 L of crude oil, if the water has its temperature raised from to it boils, and the resulting steam is raised to (b) Discuss additional complications caused by the fact that crude oil has a smaller density than water. 11: The energy released from condensation in thunderstorms can be very large. Calculate the energy released into the atmosphere for a small storm of radius 1 km, assuming that 1.0 cm of rain is precipitated uniformly over this area. 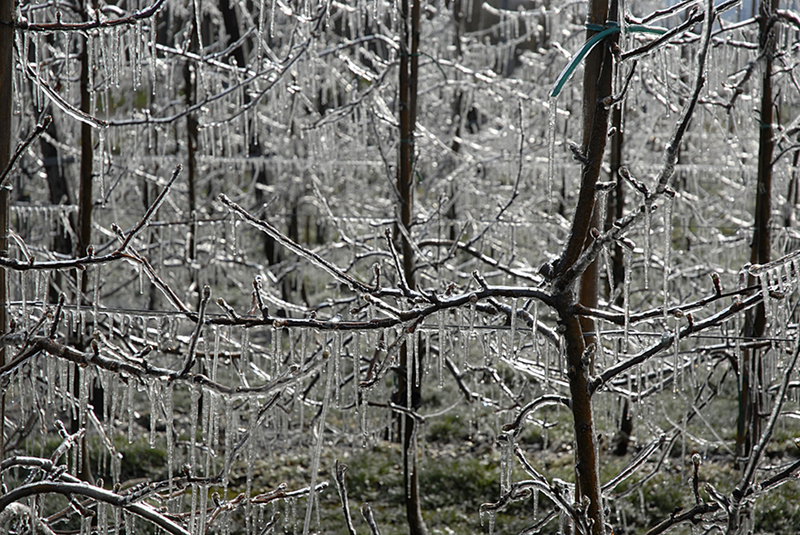 12: To help prevent frost damage, 4.00 kg of water is sprayed onto a fruit tree. (a) How much heat transfer occurs as the water freezes? (b) How much would the temperature of the 200-kg tree decrease if this amount of heat transferred from the tree? Take the specific heat to be and assume that no phase change occurs. Problem-Solving Strategies for the Effects of Heat Transfer. 14: A 0.0500-kg ice cube at is placed in 0.400 kg of water in a very well-insulated container. What is the final temperature? 15: If you pour 0.0100 kg of water onto a 1.20-kg block of ice (which is initially at ), what is the final temperature? You may assume that the water cools so rapidly that effects of the surroundings are negligible. 16: Indigenous people sometimes cook in watertight baskets by placing hot rocks into water to bring it to a boil. What mass of rock must be placed in 4.00 kg of water to bring its temperature to if 0.0250 kg of water escapes as vapor from the initial sizzle? You may neglect the effects of the surroundings and take the average specific heat of the rocks to be that of granite. 17: What would be the final temperature of the pan and water in Chapter 14.2 Example 3 if 0.260 kg of water was placed in the pan and 0.0100 kg of the water evaporated immediately, leaving the remainder to come to a common temperature with the pan? (a) Calculate the heat transfer necessary to evaporate this amount of liquid nitrogen and raise its temperature to (Use and assume it is constant over the temperature range.) This value is the amount of cooling the liquid nitrogen supplies. (b) What is this heat transfer rate in kilowatt-hours? 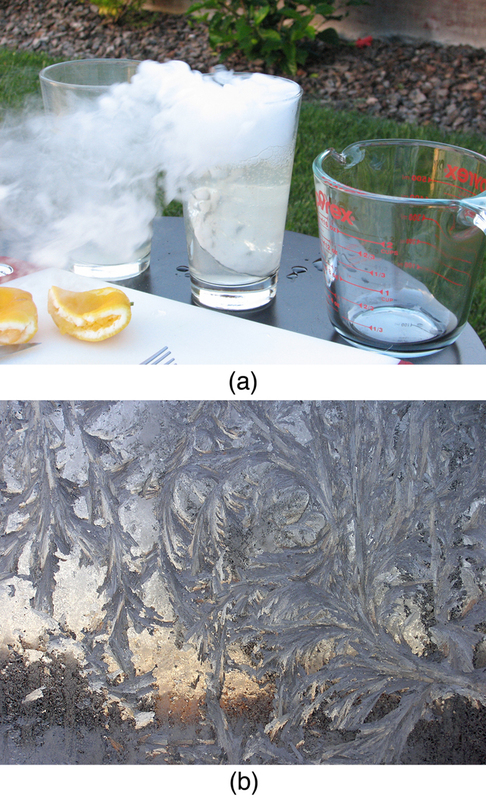 (c) Compare the amount of cooling obtained from melting an identical mass of ice with that from evaporating the liquid nitrogen. 1 Values quoted at the normal melting and boiling temperatures at standard atmospheric pressure (1 atm). 1: Snow is formed from ice crystals and thus is the solid phase of water. Because enormous heat is necessary for phase changes, it takes a certain amount of time for this heat to be accumulated from the air, even if the air is above The warmer the air is, the faster this heat exchange occurs and the faster the snow melts. (b) Crude oil is less dense than water, so it floats on top of the water, thereby exposing it to the oxygen in the air, which it uses to burn. Also, if the water is under the oil, it is less efficient in absorbing the heat generated by the oil. 14.3 Phase Change and Latent Heat by OpenStax is licensed under a Creative Commons Attribution 4.0 International License, except where otherwise noted.